The suspension system of every vehicle has something called a control arm bushing. The bushing is comprised of two sleeves of metal that are encased in rubber. It is positioned between the vehicle’s frame and the control arm. 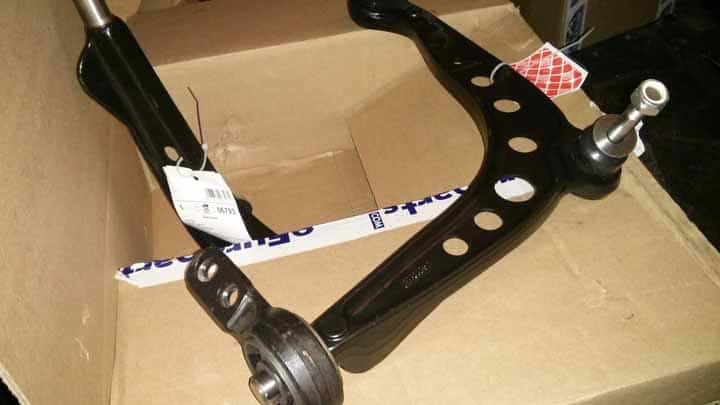 As you may know, the control arm is what connects the frame to the wheel hub. This is how you’re able to steer the vehicle. If there are any issues with any of these parts, such as the lower control arm bushing, then your driving experience will be impacted. The purpose of a bushing is to reduce the amount of vibration created between the frame and the wheels underneath it. That way, you have a nice pleasant drive without any unpleasant or inconvenient disturbances. Without these bushings, you would have metal making contact with other metal and that would cause all kinds of negative symptoms. These symptoms will be recognizable right away as they occur. If you’re driving a standard front-wheel drive car, then it will only contain a lower control arm and a lower control arm bushing. It is the 4-wheel drive cars like SUVs and trucks which have both a lower control arm and upper control arm with bushings for each. Chances are, if you’re driving an economy class car, then it just has a lower control arm. Like most parts of your vehicle, the lower control arm bushings are going to wear out after a while. Once this happens, you can expect a lot of problems to arise while you’re driving as a result. Assuming you’re driving a front-wheel drive car, below are the top 3 common symptoms that you can expect to see if your lower control arm bushing starts to go bad. Clunking Sounds – When your lower control arm bushing becomes too loose or worn out, then you will start to hear a clunking sound coming from underneath your car. This sound is caused by the bushing getting knocked between the frame and the control arm. You will hear this sound get even louder if you’re driving over rocky or rough terrain that is not flat. Over time, the sound will continue to get louder until the bushing eventually breaks altogether. Vibrating Steering Wheel – When your lower control arm bushing begins to go bad, the first symptom you should notice is a vibrating steering wheel. You’ll feel the vibration in your hands as you steer the vehicle on the road. As you step on the gas pedal and increase the vehicle’s acceleration, the vibrations will become more intense. This is something that will easily get annoying so you’ll want to do something about it quickly. Steering Wheel Pulling – Do you notice your steering wheel pulling too much to either the left or right as you’re driving? If your bushings are too worn out, then the steering alignment of your vehicle will be off center. Although this won’t put your life in immediate danger, it will require you to work harder as a driver because you’ll always have to keep the steering wheel steady so that the car continues to drive straight. The cost to replace a lower control arm bushing will vary, depending on the make and model of your vehicle. The average cost for a new bushing is between $110 and $400, while the average labor costs are between $95 and $250. This means you’re looking at a total of between $205 and $650. There will also be fees and taxes added on to this amount as well. To lower your costs as much as possible, shop around at different auto parts stores and see where you can get the best deal.